NanoInk, an enterprising Skokie-based company in the growing nanotechnology field, shut down this past week after losing a major chunk of its funding. While much could be speculated why the company folded, the impact will be felt on the number of high schools and universities that invested in its NanoProfessor curriculum program to train students in the fast-growing field. The U.S. needs this type of corporate-education cooperation to keep it in step with the world. We hope some other company can pick up where the Skokie-based company stopped. IEEE Spectrum offers a bit more on NanoInk’s demise. Why Did NanoInk Go Bust?. Erik Person wants you to change how your company connects. As president of TeamLogicIT in Schaumburg, Person and his team have been helping suburban small and medium sized businesses with their IT needs for almost a year. But his company’s latest offering, he said, will definitely change the way small businesses will connect and collaborate with its clients and staff. TeamLogicIT is one of a few local companies that’s authorized to sell the Mondopad, a large touch screen videoconferencing solution built by Portland, Ore.-based InFocus. Person describes the Mondopad as a low-cost business solution that combines conferencing, collaboration and sharing tools into one device. Resembling a large-screen television, the Mondopad features a full 55-inch or 70-inch touch-enabled screen with an HD camera mounted at the top and a 50-watt sound bar beneath. It’s heart is an Intel PC processor and, combined with software built on the Windows 7 operating system, the Mondopad can handle videoconferencing, presentations, and meetings using video/audio, whiteboard, PowerPoint, and any data sharing programs used in business. “It’s filling a space that’s pretty much empty right now,” Person said. He stresses the device is an all-in-one solution, allowing businesses to conference, collaborate and share anything that can be done in a Windows-based environment. “You can switch to a whiteboard, use the web browser, highlight and annotate Web pages or pictures on the fly,” he said. “The people viewing can see your screen the whole time, so they can see what’s going on.” What’s discussed and annotated on screen can also be saved to a PDF file and distributed to the participants, he added. And since it’s Windows-based, it can run the same business software currently running on your PC, like Word, Excel or PowerPoint. InFocus is no stranger to the business world, as the company is best known for building LCD projectors and other audio/visual accessories. The company’s target for the Mondopad are small and medium sized businesses that need a comprehensive conferencing solution at a reasonable cost, according to Abigail Rath, InFocus business development manager. Rath noted what makes Mondopad unique is, even though the device is loaded with its own conferencing software, it is still compatible with existing conferencing systems, such as Cisco or PolyCom, and can also use web-based conferencing software such as GoToMeeting or Skype. “When you think about it, it’s just a beautiful PC with a touch enabled device,” Rath said from Portland during a recent conference call on a Mondopad at TeamLogicIT’s office. “So anything that your customers are using that are proprietary, they can load it as a third party app on the Mondopad. Person notes that’s particularly attractive to businesses that already own an expensive system but don’t want to throw everything out to move to Mondopad. And because of that flexibility, you don’t need to be on a Mondopad to confer with one another. Person and Rath note people in the field can connect with Mondopad through notebooks and tablets. Person sees the ideal Mondopad user as a small or medium sized business that either has multiple locations or a number of its employees in the field. One of their clients is a construction company with offices in Chicago and Texas. The cost of the Mondopad starts at $5,949 for the 55-inch device and $10,499 for the 70-inch model, which includes hardware and software, Person said the price is about three to four times less than purchasing the device’s functionality separately. TeamLogicIT also provides installation and support services, he added. 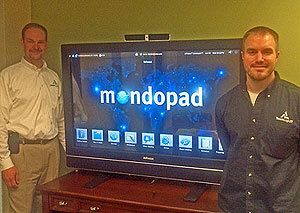 For more information on the Mondopad or TeamLogicIT services, contact Person at (847) 925-8400 or eperson@TeamLogicIT.com. It goes without saying that more people are using tablets at work. You probably didn’t need a professional study to tell you that. The vast majority said tablets make work more enjoyable and helps them better collaborate with co-workers. Only 6 percent felt they were “pressed for time,” according to the survey. Joe Woods, CDW’s director of mobility solutions, said the respondents believed tablets made them more efficient in their jobs. In addition to tablets’ portability, Woods said instant access to information and co-workers were also key benefits listed by the respondents. “Eighty four percent said they thought tablets made them better multi-taskers,” Woods said. “A lot of that goes around collaboration and getting information on the go. Respondents saying they gained more than an hour in daily productivity was a significant find, Woods added. “It certainly talks to the value of the tablet as a workplace tool to get that kind of productivity,” he said. The integration of tablets in the workplace is even more significant given the short time that tablets have been available (remember, Apple introduced the iPad to the world in 2010). The survey found 56 percent of users have had their tablets for a year or less, while 32 percent have owned them for two years and nine percent used a tablet for three years. And it’s the employees — not business owners — that’s been leading that integration. Fifty nine percent of the respondents said they use their personal tablet, while 34 percent use company-owned devices. Seven percent used both personal and company-supplied devices. What do they use it for? The “can’t live without” features, according the survey, are email and web browsing. Tops on the “it helps” features are office/productivity programs, such as word processing and spreadsheets, and file storage. Features that weren’t popular, surprisingly, were photo and video editing. Even more surprising, social media applications ranked low — at number 6 — in the “can’t live without” list. Multi-tasking is big among tablet users, as only two percent of those surveyed said it is the only device they use at work. The majority still use desktop and laptop computers in addition to tablets (68 percent and 62 percent respectively). Fifty-three percent said they use their smartphone in conjunction with tablets, while 22 percent they use their cellphone. “What we’re seeing is that workers are not replacing their laptops or PCs, but are using multiple devices,” Woods said. He added that 74 percent said they use three devices, and 29 percent use four. One thing the survey did not reveal, he said, was any diversity in how tablets are being used between the different industries. “By and large, people use their devices in the same way and in the same rate of penetration” in each industry surveyed, Woods added.